CHRISTCHURCH (Reuters) - Tightening New Zealand's gun laws is at the top of Prime Minister Jacinda Ardern's agenda as she meets with her cabinet on Monday for the first time since the mass shooting in Christchurch that killed dozens of Muslim worshippers. The death toll from the massacre stands at 50, with another 50 people injured, after a gunman burst into a mosque and opened fire on worshippers with a semi-automatic rifle and high-capacity magazines, and then attacked a second mosque. 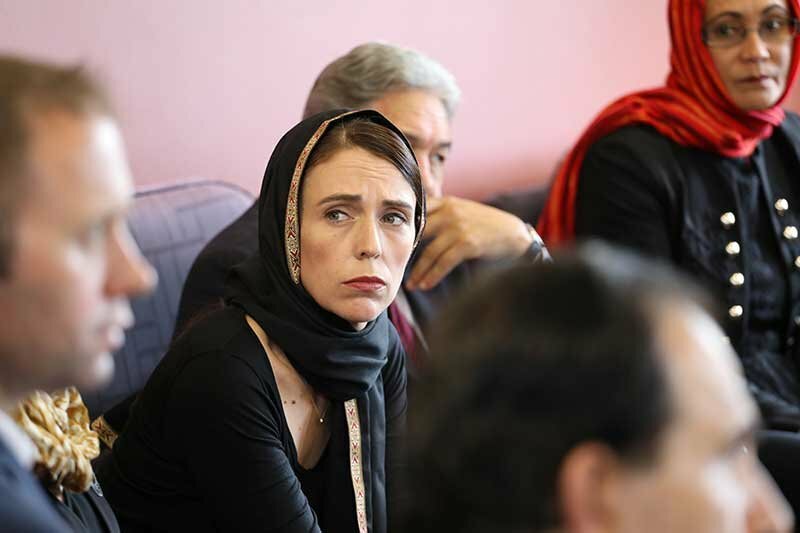 Ardern was the first signatory of a national condolence book for the worst peacetime mass killing in New Zealand that she opened in the capital Wellington on Monday. The shock of the attacks has led to calls for an immediate tightening of laws to restrict access to some firearms, particularly semi-automatic weapons such as the AR-15 rifle used by the shooter in Christchurch. "What the public rightly are asking right now is why is it and how is it that you are currently able to buy military style semi-automatic weapons in New Zealand, and that's the right question to ask," Ardern told TVNZ earlier on Monday. "There are ways we can bring in affective regulation of firearms that actually target those we need to target and that is our focus." A Radio New Zealand report said more than 99 percent of people who applied for a firearms licence in 2017 were successful. The report was based on police data secured through an Official Information Act request, although it was not clear who made the request as those details had been redacted. In 2017, there were 43,509 firearm licence applications, and only 188 applications were declined, the data showed. After Ardern vowed at the weekend to change the gun laws, there were media reports that people were rushing to buy guns before any ban was implemented. New Zealand's top online marketplace Trade Me Group said it was halting the sale of semi-automatic weapons in the wake of Friday's attack. Police were out in force on Monday to assure Christchurch residents of their safety as they returned to their weekday lives, after a lockdown affected parts of the city on Friday after the shootings. Police said the airport in the southern city of Dunedin, had been reopened early on Monday after a suspicious item found on the airfield turned out to be a hoax object. And Australian police executed two search warrants in towns on the New South Wales mid-north coast related to the investigation. Mo, a volunteer who had flown in from Brisbane to wash the bodies, said the people who died in the mosques were classified as martyrs. That meant there were different views as to whether they would be washed or not because he said Islamic jurisprudence said martyrs are not to be washed as their blood was witness to their martyrdom. "But some people have said because it was not a battlefield it is okay to wash the body. But it is at the discretion of the family," said Mo. He asked to be identified by just one name. Question: Is removing NZ'ers right to own a firearm a form of mass punishment?? They have not had any major issues with firearms before this Australian Person committed this horrendous, unforgivable act. Question: Should other curtailment or removal of "rights" be considered an appropriate response? Can we not learn from the USA & Britain et. al. - The "Patriot Act" - Americans (USA) were promised it would end in 2005, it was extended, after a further 4 years, then extended again, then yet again by Obama... Loss of hard won freedoms by our USA brothers and sisters?? Of course you be the judge. The has to be a price - say many. Why? does there have to be a price? ?, ask some. They're only limiting MSSA weapons, not other rifles which can be used for other purposes. Just semi-automatics which are designed only to kill other humans. It is a very small minority who will oppose this. Personally I see all guns as having ONE purpose - to KILL. I have no interest in the nonsense argument(s) "Sporting Shooters" etc.. etc.. In my opinion "The Gun" has no place in sport. My argument is about removing freedoms from a society that functions well, in response to an incident. The price of freedom sets a high bar. Those countries that enjoy a high level of freedom, have often paid a high price for it. Never let a good crisis go to West. Looks like Arden is using this event as her excuse to both ban guns and institute Chinese style internet controls. The latter is probably more dangerous in the short term. Agree - but their has to be an examination of laws to make sure they are fit for purpose. One thing NZ must consider is if a Moslem gunman had carried out a similar attack on a Christian church, Jewish or Hindu place of worship, would their response be the same. It should be the same response whoever the victims and perps are and must not be knee jerk. We've seen draconian laws introduced in the UK regarding knives, which does impact on a vast majority due to the actions of a tiny minority who it seems ignore the laws anyway. Once government gets control of the internet, given the importance now of this media, then very dangerous scenarios are possible. Individual freedoms are being eroded in the "Western" style democracies that have traditionally cherished and defended them. Terrorists have presented politicians with an opportunity that many are only too eager to grasp. Wow dude are you saying you hate guns but realize the bottom line is a freedom issue? Wow. Thats rare from a hoplophobe. Changing laws to suit the times. He’s an Australian citizen who more or less have automatic residency rights to live and work in NZ indefinitely. He bought the things entirely legally. The mathematics of risk are very clear. If an item is dangerous, reducing the number of those dangerous items reduces the risk associated with the items. Surely not? I thought it was ‘thoughts and prayers’ which did the trick. what are they going to do if people start sharpening spoons? make everyone eat with their hands?